The Newtown Roots Band: another fantastic community activity! We’re very lucky to have fabulous local musician and teacher Ali Jones base this fun project in the hut. It’s aimed at anyone and everyone who wants to play their acoustic instrument with others. Perhaps you already attend sessions in a pub somewhere, or perhaps you feel a little intimidated by such sessions – like you need to be able to play at a high standard or to know the tunes in advance. Either way, the Newtown Roots Band is for you. 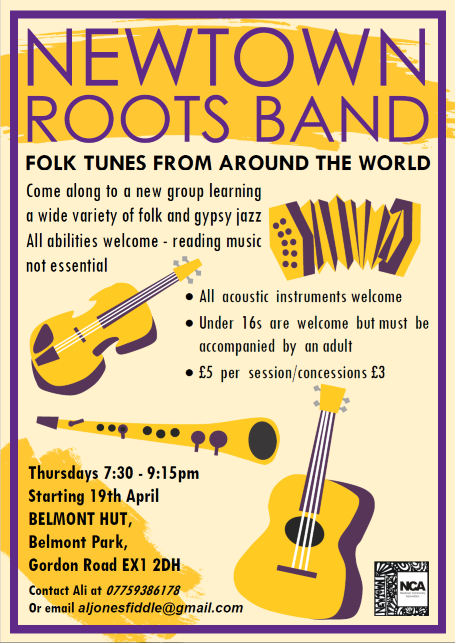 We’ll be playing a variety of folk from all over the world, including some gypsy jazz. There will be parts for everyone at all levels of ability. If you read a bit that’s fine but it isn’t essential. All acoustic instruments are welcome. The wider the variety the better. We’re really looking forward to it. Hope you can join us. Please spread the word! You can download a flyer here. Print a copy and display it somewhere prominent if you can.